One small click for viewers, one giant leap for Give Back Yoga: introducing our new-and-improved website. A mobile-friendly responsive design that’s easier to read and navigate, for all devices and screen sizes. A more comprehensive look at how each of our partner programs brings yoga to a specific population – and how you can support their work. 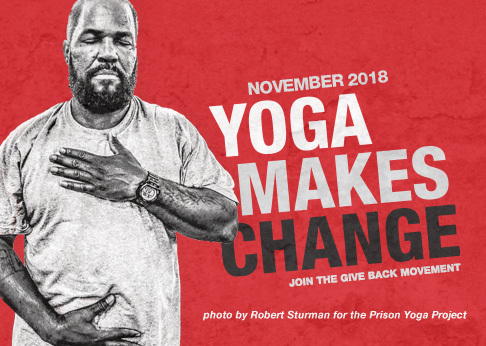 A new Campaign section, where you can learn about special projects that are bringing yoga to those who can benefit most. A new Trainings and Events page, so you can easily search for trainings or benefit events in your area. Access to our new 108 Studio Partnership Program, which offers studios a framework for building community while supporting yoga service. An enhanced Membership Program that shows gratitude to our monthly donors through Give Back Yoga gifts and resources. A more streamlined way to apply for a supply grant, supported by our corporate partner Gaiam. A better platform for recognizing the support of our corporate Friends, Partners and Sponsors. Enhanced security for making donations or shopping for therapeutic yoga resources. Even more ways for anyone and everyone to get involved in yoga service. Click around and tell us what you think! We’d love to hear from you. Dot Think Design, our web design company, for coordinating the process of brand development, site design and development, feedback and testing. Their creative vision and dedication to the process made this project a success. Ramblin Jackson, a Boulder-based web marketing and video production company, for contributing SEO research and optimization, SEO training sessions, and the creation of a Give Back Yoga video. Their generosity is helping us to share yoga with a broader audience. Give Back Yoga’s Board of Directors and team members, for providing guidance and support for the visioning and buildout of new programs and offerings, and the site itself. Through passion and compassion, all things are possible.